With the $4.9 billion acquisition of Allied World Assurance, Prem Watsa aims to complete Fairfax Financial Holdings' largest-ever deal. But for this value investor, price is more important than size. 'Twas the Monday before Christmas, when all through the market, nothing was stirring ... except Canadian insurer Fairfax Financial Holdings (NASDAQOTH:FRFHF), which announced that it is acquiring Zug, Switzerland-headquartered Allied World Assurance (NYSE:AWH) in a deal that values the target at roughly $4.9 billion -- the largest acquisition in Fairfax's history. With this deal, Fairfax Financial CEO Prem Watsa, who is unafraid to make contrarian bets, is doubling down on the insurance business by adding a firm that shares a similar profile to Fairfax's. The deal numbers are these: As of Friday's close, the cash-and-stock offer is worth $54 per Allied share, an 18% premium to its closing price. For each one of their shares, Allied World investors will receive $10 in cash and the balance in Fairfax Financial shares. The share component is itself broken down into two pieces: The first, worth $14 per share, has a share exchange ratio that is based on Friday's closing price for Fairfax and is already known. The second slug of shares, worth $30 per share, will depend on the average price of Fairfax shares in the run-up to the transaction closing. Finally, Fairfax has the option to replace this second share component with cash in an amount up to $30. Assuming, Fairfax chooses not to exercise that option, Allied World shareholders will end up owning approximately 27% of the combined company. Phew! That complexity bears the hallmark of a dealmaker like Watsa (and it may help to explain the 5% discount to the offer price at which Allied World shares were trading on Monday). On the face of it, the deal looks like it is in line with practiced private market values. The transaction value is equal to 1.79 times total revenues and 0.35 times total assets, both multiples that represent a modest premium over the median figure for eight comparable deals compiled by Bloomberg (1.69 and 0.31, respectively). But look a bit closer and Watsa would appear to have negotiated a decent price: The $54 offer is equal to 1.30 times Allied World's book value at the end of September (1.51 times tangible book value), which hardly seems unreasonable for a company that has grown its book value at an annualized rate of 13.6% over the past 10 years. At that rate, Fairfax's offer price is exactly equal to Allied World's expected book value two years out. Source: Fairfax Financial investor presentation. One has to surmise (or hope) that this is a case in which the similarity means market share gains for the combined entity, rather than substantial overlap that needs to be trimmed. One clue that it is the former is contained in the press release announcing the acquisition, in which Watsa says: "Allied World will operate within the Fairfax group on a decentralized basis after closing." As the following graph suggests, both Allied World and Fairfax Financial are better-than-average businesses. Can the combination of the two continue to produce satisfactory results? There is no reason not to think so, particularly if Allied World retains a high degree of autonomy. Still, a decentralized structure begs the question of where the deal's synergies will come from? One possible avenue to incremental returns would be to have Watsa manage part of Allied World's insurance float. However, looking for major synergies may be missing the point; indeed, given the price paid, the deal's success doesn't appear to depend on them. 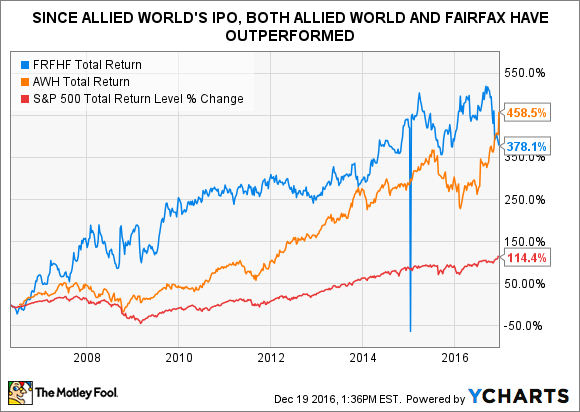 If Allied World goes about its business the way it has since 2001, that ought to be enough to enable investors to earn a decent return. As any good value investor (such as Prem Watsa) will tell you: Pay attention to the price you pay for a good business, and the rest will take care of itself.